City of Bristol Choir travels to Lyme Regis to give a concert in aid of the church’s Organ Appeal. 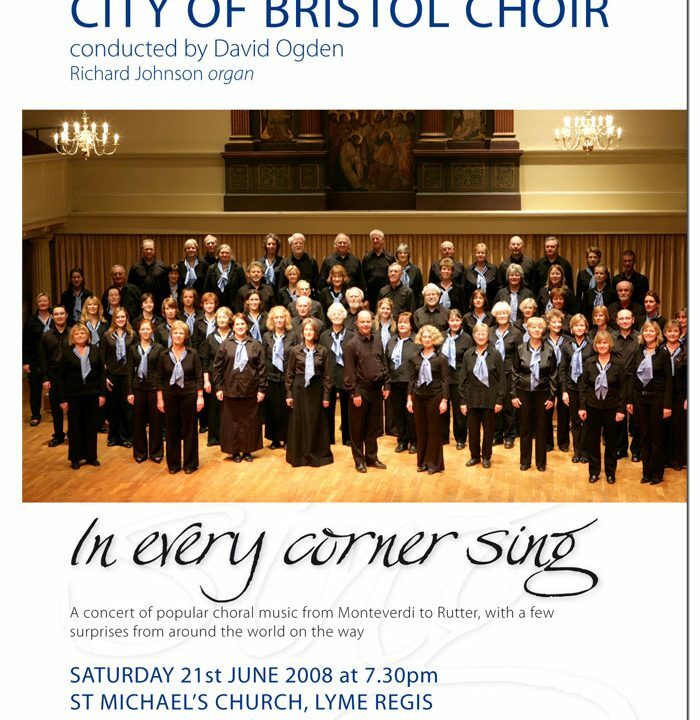 City of Bristol Choir, conducted by David Ogden, will perform popular choral music from around the world at St Michael’s Church on Saturday 21st June at the invitation of the church’s Director of Music, Alex Davies. As well as performing music by Monteverdi, Palestrina, Faure and Mozart, the choir will sing some new pieces by John Rutter and excerpts from David Ogden’s Cabot Circus Cantata in a variety of languages ranging from Hungarian to Swahili. St Michael’s Church’s Organ Appeal is fundraising to build a new organ from scratch in the town’s church. The target is £280,000 and the appeal is well on its way, having raised £187,500 since it was launched in June 2006. A wide variety of events have been held including a sponsored silence, choral concerts, recitals, cream teas and dinners. Tickets £10 (£8 concessions, £2 children) from Lyme Regis Tourist Information Centre on 01297 442138.